I've substituted the Rowan All Seasons Cotton with 6 skeins of Cascade Cotton Rich and really love how great the stitch definition is. The only thing not to be loved about this cotton is how the label says "Hand Wash Only" hahahaha. Yeah. Uh huh. Right. I don't even really mind the cotton shedding on my hands. Yes, my hands can get sweaty with the excitement of cabling (and yes, I learned via Wendy Knits to cable without a cable needle). 1. The color is called buttercup. A flora named yarn for a flora named pattern. 2. I'm making it extra large for a one year old (he's almost two months old) because bigger kid-knits are better than smaller, it might take me a while, and the kid is super-cute in all his chubbiness. Hey, I was majorly chubby, too. 3. The YARN HARLOT has read my blog and left a comment. I'm stunned, yes you made it in the top three Stephanie. A) Not to insult my readers, the whole 10 of you, but I'm stunned I managed to attract the famous lurker and have her leave a comment. I say DUDE in all my California born privileges to surfer talk B) Someone other than who I've Secret Pal'd with or knows me in person can actually possibly spell my name, or use RSS . Yes, my friends who refuse the manna of goodness called RSS. And the boyfriend who is regularly notified and quizzed on blog entries. 4. Not pictured clearly here, but evidently my double yarn overs were absolutely deformed until Charlene came and showed me how to make better yarn overs. 5. due to my malformed deformed yarn overs, I have two tiny buttonholes which will probably fit a US #8 needle but not any reasonably sized button. 6. After I took the pic I knit another monumental 4 inches or so. Hey, it is cotton and cabling. 7. I watched three episodes of Stargate SG-1 while working on the Right front. On Monday. In a row. 8. Buttonholes and Seed Stitch don't seem to play well with each other. I'm working to get a ombudsman to oversee with specific instructions. 9. Even though I think I know the pattern, it works much better and less wonky cabling if I'm a- paying attention and b-actually following the pattern or at least using it as a reference for "hmm. what went on here???" 10. Who really hand washes cotton. I'm going to toss it in permanent press on warm. Hey, it is big, it is okay if it shrinks some. Maybe a swatch first, though. The Japanese Bookstore got my other major purchase where I went in to buy a postcard and came out with $30 worth of stuff. Some of it pens and notebooks (always a nice pick me up applicable to school. Really, I need more pens. I don't have every single one as of yet) but I also scored this Learn How to Crochet Book! Do you recognize him? The Prince of Knitting! (as seen on pinkurocks.) This book is filled with great step by step instructions. Yes, it is in Japanese. No, I do not read Japanese but there are extensive graphics. 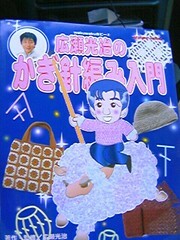 And my neato crochet pattern books are in Japanese thanks to a pinku swap! I swore I would learn crochet for two patterns in a book she sent and so I shall. Once I find my crochet hook. Blogs are awesome. Bloggers are super-awesome. Better than wonderful colors of Alpaca Yarn. So, I got a little neat something from you in the mail, but not before some kind of crazy post office mangler got to it. Thank you for thinking of me (and special thanks for chocolate - yummy). The envelope that you sent was MANGLED and inside a post office envelope saying "Oops. We're sorry". I can't tell how long about you mailed it to me, but I just wanted to stop by and say thanks! When I got my Harlot comment I created a special folder in my email account just for her. :) It's like a sickness. "Yes, it is in Japanese. No, I do not read Japanese but there are extensive graphics." You are silly. SILLY. And I can totally see you doing this. This page contains a single entry by freecia published on May 25, 2005 9:48 PM. 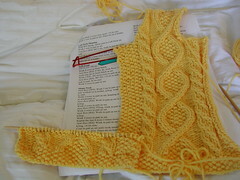 knitty surprise was the previous entry in this blog. Full Thread Ahead is launched! is the next entry in this blog.